Cats are actually very calm and relaxed by nature and don’t really bother people unless they are being bothered, distressed or trying to tell you something. It is important to know how to stop a cat from biting, because not only is it an unpleasant experience, it could also lead to infections and leave marks on your skin. If you have a cat and want to interact with him better or if you are considering getting one and want as much information as possible beforehand, then this is for you! This article outlines methods you can adopt for training, disciplining and taming your cat. Read on to find out more. Reacting calmly towards your cat will make sure that he doesn’t get frightened by you. Don’t shout, physically harm or get angry with him either. When you call your cat, don’t punish him as it will just confuse him. He most probably has no idea why he is being treated so negatively. Plus, he is expecting you to act pleasantly with him when you call him. When your cat starts scratching and biting, refrain from touching him and put your hands away. If he doesn’t settle down immediately, be very calm and take him off your lap. Move away from him and don’t come back until he settles. Do not try to soothe your cat after his episode of biting and scratching. Show him that you are displeased instead. When you finish disciplining him, don’t be affectionate by petting and cuddling him as it will confuse him and even make him start scratching you just so you will cuddle him. If you want to know how to stop a cat from biting you need to figure out why he is biting and scratching you in the first place. He may just be overexcited and playful, bored, frustrated or he may be trying to get you to stop doing something that he doesn’t like but you’re oblivious to it. Try and find out what it is and if you do, try and find a solution to it. Punish your cat if he misbehaves and reward him when he behaves well. In order for your cat to know when he is being rewarded or punished, make sure you punish or reward him straight after, depending on which type of behaviour he exhibited. Be consistent with your cat. Spend between ten to fifteen minutes just playing and interacting with your cat. Discourage him from scratching and biting and make him play with toys by dangling the object above him. Set times for playing with him and try to choose periods when you think he is more likely to be playful. When your cat gets too rough, put him on time-outs. 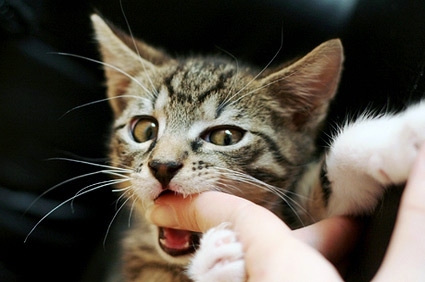 It is a denoting technique on how to stop a cat from biting. As soon as he bites or scratches you, walk out immediately. Do not even try to pick or touch him because it could make him harm you even more. Cats thrive off attention and affection. So if your pet doesn’t stop misbehaving, ignore him completely, leave the room and shut the door until he calms down. If you touch your cat and move him into a different room, then this is a way of showing affection. He will think that you are rewarding him. You can assert dominance on your cat by clapping your hands and telling him “no” firmly. Also, stare directly at him in a fierce way. However, do not physically harm or yell at your pet. After you scold him with a “no” and a clap, walk out of the room and come back after a few minutes. If you want to discipline a young kitten, maintain the same firmness as you would with an older cat but be less aggressive, as it could frighten the kitten. Another reason why some cats bite is because of fear. Also, getting your cat neutered or sprayed will allow you to be the dominant person in the house. Spray your cat with a tiny water gun or spray bottle every time he does something naughty and always make sure to do it straight after the offence, so that he learns to associate the two things together and will not do it again. This is a fantastic method, especially if your cat tends to attack you at a certain time or in situations. For example, if you are working on your computer, you could have the spray bottle ready to spray him if he disturbs you. If ever you are trying to get into another room in the house and your cat stands in your way snarling and hissing at you, think about it from his point of view. He probably feels trapped and thinks you are blocking his way. So simply step aside, wait for him to go through and then carry on with what you were doing. Please also note that if your cat scratches or bites you, do not feed him for twenty minutes because he will think you are rewarding him. Cats often get very playful to the extent where they start to scratch. To avoid being scratched, play with them with fishing toys instead of using your fingers. You can also attach toys to a string, a catnip mouse or laser-light pointer. Construct an enclosure outside for your pet, and put boxes, branches and perches and shelves for your cat to play in. Your cat will be able to play more with insects and even do a bit of hunting. It would be leave you some private time if you create an environment for him that is a bit more complex. Study your cat and know when is the time that he doesn’t want to be touched or played with. If his pupils are huge and he is whipping his tail then take that as a sign. If your pet knows that you understand his body language then he will most likely not bite or scratch you. Your cat could be nervous so speak to your vet and find out if your cat is okay. If it’s a case of him needing to have his nerves calmed down then the vet could give him some medicine or food for it. There is a substance called tryptophan that can be mixed with cat food to help them feel more relaxed.